All That Is Solid ...: Can the Tories Win a General Election? Can the Tories Win a General Election? Politics is weird. 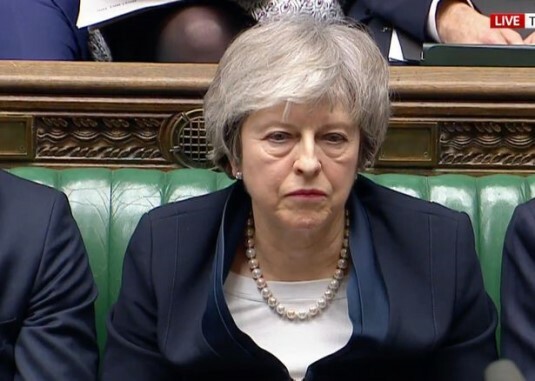 After surviving her no confidence vote last week by the skin of her teeth, and with a general election seemingly off the agenda for the foreseeable everyone's gone election crayzay. More than one report over the weekend talked about preparations being made by CCHQ for a snap contest, and Tory MPs and commentators have mused aloud about its possibility. If that wasn't peculiar enough, it was The Sun who published the most interesting piece about the Conservative Party's plans. I know, reading this rotten rag for its politics coverage proved worthwhile for once. In an entertaining report by Tom Newton-Dunn, it's panic stations in the thinning ranks of the Tories. Internal polling, not cited of course, suggests a minority Labour government in the event of another general election and the party is ill-prepared to fight a gruelling battle in the marginal seats. They haven't got the people, their membership is demoralised, and their data mostly dates from the 2015 general election. Of course, reports like this make it less likely for Tory MPs to support a general election should May be forced into calling one, but one cannot but cite its most delicious line. Quoting an (obviously) unnamed "senior minister", he moaned how once solid streets in their constituency have become toxic territory. "If you knock on a door and they have books on their shelves, you can be pretty sure these days they’re not voting Tory." They're in a rum do, and a general election probably isn't going to happen. But in the event of one at the end of February how likely is it the Tories are going to do as bad as The Sun reports? Let's think through this. Out of the gates, the Tories have three in-built advantages. The print media are mostly in their corner, and their talking points have the tendency to dominate the broadcast media agenda - regardless of rules about balance in the immediate run up to polling day. Second, while print's influence is waning it is consumed disproportionately by older people, and these still remain more likely to turn out and vote, which cancels out the lead Labour has in younger age cohorts. Lastly, the Tories are the party of Brexit. This is the ideological glue holding together their declining bloc of voters. As May has shown zero interest in other approaches to Brexit, the Tories are singularly ill-suited to appealing beyond their existing voter group, and so like 2017 it's going to be a turnout game - though the time is rapidly coming when this is no longer a viable strategy and they're going to have to think about winning the active support of swing voters and younger people. That's for the future, this is now. What else can we expect? With a prospectus that can hardly be described as positive, the Tories will resort to type and scaremonger. It's what they do. More evil Corbyn and John McDonnell, more Labour in the pockets of the Scottish nationalists, more tax and spend, scrapping nukes, abolishing the army, smashing the monarchy and nationalising your iPad. Frightening the horses has proved effective time and again, and the Tories are past masters at using fear to cow a segment of the electorate into voting for them. And while this played out in 2017, it wasn't enough to push them over the line like it did with Dave two years earlier. However, one lesson they have drawn from that debacle was their failure to put the frighteners on about the economy - a mistake they're unlikely to repeat twice in succession. Nevertheless, this isn't a foregone conclusion. May would frame it as the Brexit election, and so concentrating on that could muddy her warnings about economic collapse, violent revolution and gunpoint expropriation. The second difficulty was how super savvy Labour proved to be in driving the agenda last time: the agenda could easily be wrestled from her again and the election become about what kind of life people should be living. On wages, housing, security, the NHS, and so on, let's just say there's a reason why the Tories prefer peddling night terrors over and above the scrutiny of their record. Stacked against the Tories is the power of social media. It's not just readers of books they need to worry about. If the Tories are going all out on Leave, they need to know "their people" are infrequently online and, it would stand to reason, less able to be mobilised by digital networks. As 2017 demonstrated, Labour was able to significantly close down the Tory media advantage by leveraging its mass membership as an electoral factor in sharing material with eyeballs that normally look askance or evade contact with matters politic. More important was the party's social density. As mentioned here many, many times there are very few people in the country whose social circle is untouched by a Labour Party member. A physical party presence, of knowing someone who can answer questions about the party, its policies, and offer a flesh and blood view in opposition to whatever's coming out of the TV, papers or radio is priceless. And there's the small matter of activism. Labour moaners might whinge about not seeing hundreds of Corbyn supporters at CLP meetings and ward leafleting sessions, but when the chips are down they will turn out in massive numbers again. To this the Tories have no answer. Still, the Tories have the luxury of facing a divided opposition, and one that might become even more divided. Unlike last time, it would be difficult for the Labour Party to nod sitting MPs and 2017 candidates through as automatic selections. It is unconscionable how dead weights like Chris Leslie shouldn't face a full selection meeting. In the event of the old Blairites decanted out of the party, the prospect of a new centrist formation cannot be ruled out and with it the possibility of leeching Labour votes. Then again, more likely is it would sink without a trace thanks to lack of time to build a name and, well, its protagonists are guaranteed to bring zero charisma and even fewer recruits to proceedings. The Tories might hope the LibDems going hard remain in their campaign will also divert Labour votes - because it worked so well in 2017. However, this could just as easily attract Tory remainers suspicious of/horrified by left wing Labour. And as for the SNP, they're going to be emphasising Brexit and remain more than independence on this occasion, which poses those Scottish Tory seats a threat. In sum, it's a mixed picture. The Tories aren't in a good place, but thanks to their institutional support and inertia as the so-called natural party of government they could do better than The Sun suggests. But if they want to go for it, they have to go sooner rather than later. The longer they wait, the more difficult remaining the largest party, let alone retaking a majority, becomes. This week's Private Eye paints an appalling picture of a Labour lack of preparedness for a general election, and a repeat of the Sunday paper claims of dropping membership. Interestingly, when I googled the various aspects of the column it started, very quickly, to fall apart. They really are scared at the thought of another reforming Labour government, aren't they? It's not about the Tories, whose base will be the same, but the Europe-leaning would-be Labour voters. Also, it would be a steeper climb for the Labour this time, because few expected its win last - this means would-be Tories are more likely to come out and floating voters think twice. JC was a novelty before, now he seems like a real possibility that may harden resistance. On the other hand, pro-EU Tories may stay at home. Deckchairs and Titanic spring to mind. The polling does not account for the dynamic of a General Election. If May concedes to the party rank and file that backs No Deal by around 80%, it will be an opportunity to ditch Remainer Tory MP's, for No Dealers, which makes their calculations much easier, with the backing of DUP hardliners. Moreover, Labour's pro-Brexit stance has probably destroyed its chances in Scotland, so expect to see Labour lose seats in Scotland, with the possibility of the anti-Tory vote being split there, giving them a chance to pick up additional seats in Scotland. The same is probably true in some of the Southern marginals, where Labour's pro-Brexit stance will lose it votes, causing a splintering of the anti-Tory vote. The Tories will go into the election with a fairly easily understandable and consistent hard Brexit stance. Peston last night showed that voters have not understood Labour's stance - who could blame them? - and that confusion over the stance has become greater not less, in recent month's. That is always bad going into an election, where that position ist tested dynamically. Social media will be a negative for Labour in these circumstances, because the Tories will be able to hammer out their hard Brexit line consistently, whereas who knows what line Corbyn will be pushing, but it will almost certainly not be consistent with the line that the vast majority of his supporters will be promoting on social media. The Tories can win the next election for 2 reasons, firstly the entire corporate media will rail against Corbyn and have been railing against him every single day since he became Labour leader, secondly Britain’s colonial past and imperialist present (celebrated by the likes of Boffy and Denham) mean a good proportion of the British working class hold racist and chauvinist attitudes and demonstrate an obstinate hatred toward dark skinned people. It is quite ironic that pro imperialists like Boffy and Denham should deride Corbyn for his perfectly reasonable stance given the imperialist outlook (which they celebrate) is the thing that led to the brexit vote in the first place! Instead of deriding Corbyn they should be indulging in a year long Self-flagellation! But I don’t think they will win, as I think an hung parliament will be the outcome. I think there is a scenario where Corbyn wins and that is if May stands on a no deal. So after carrying out one emergency planning activity after another and having daily scare stories about hard brexit we are being led to believe that May will go into the next election on a No deal platform and that social media will be a buzz with aren’t the Tories so coherent! This is total fantasy. Boffy insane and unfathomable attachment to the ruling class association known as the EU is literally driving him to write drivel. They couldn't even get the actual reason why Mandy Richards was removed as a candidate correct, and rehashing that weekend lie about a 150k drop in membership was risible. A real hatchet job. I suppose the next issue will detail Tory "lack of readiness" for a snap election, or is that maybe being over-optimistic? Boffy isn't a defender of imperialism: he just doesn't defend brutal dictatorships (like those of Putin, Assad or Maduro) because said dictatorships are anti-western. Thank you for your comment and support. However, I think the grammar could perhaps have been clearer, because knowing the penchant of trolls to seize upon any ambiguity to make a point they would undoubtedly do so. To make clear my position, which is what I think you were trying to convey. I do not support imperialism in the sense of military interventions in other countries. I do support developing countries being free to encourage capital from "imperialist countries" to invest in them, for the same reasons that Lenin and Trotsky argued, which is that such investment is a vital part of those countries being able to rapidly industrialise and develop. I oppose any military intervention by an imperialist power in a developing country, even if the latter has a brutal military dictator, which is why I have called for US Hands off Venezuela. My support is for the people of Venezuela against both Maduro and against imperialist intervention. Similarly, Trotsky argued for defence of the USSR against imperialism whilst continuing to fight relentlessly to expose, undermine and overthrow the brutal dictatorship of Stalin. So, my opposition to Putin, Assad, Maduro etc. is not because they are "anti-western", which is no doubt how the trolls will try to distort your words, but is precisely because they are reactionary brutal dictators, and I stand with the workers of their countries against them. For me, as for Marx, Lenin, Trotsky and any other actual Marxist, the starting point is what advances the cause of socialism, and thereby of the working-class which is the agent of change which will bring socialism about. For the moralists and third campists, they start from their own specific moral imperative of being "anti-capitalist", "anti-imperialist", or "anti-authoritarian", or "pro-bourgeois-democratic" in deciding which of the contending camps to attach themselves to in the great global conflicts that arise. That is why whether in the case of the SWP on one side, or the AWL on the other we see these "Third Campists" actually abandoning the camp of the working-class in practice and lining up with either various reactionary "anti-capitalist" or "anti-imperialist" trends, or else with "pro-bourgeois democratic", or "democratic imperialist" trends. I start, as Marx does from being pro-socialist, and thereby pro-everything that enhances the development of the working-class, including the development and maturing of capitalism, by the fastest possible process of industrialisation. IN fact, as I wrote recently, it is not possible to be a Marxist and to be "anti-capitalist" any more than it is possible to claim to be pro-children, but anti-parent. The latter is required to progress to the former. So in short, yes, I oppose imperialism, but I also oppose brutal dictators like Putin, Maduro, Assad, because they are anti-working-class. Whether they are pro or anti-western is of no concern to me in that calculation. But, it is that latter concern that is precisely behind the calculation of the moralists and third campists, the one group supporting brutal dictators and reactionaries solely on the basis of their claims of being "anti-imperialist" the others opposing them for the self same reason, whilst as in the case of the AWL, and its support for the Libyan Jihadists, and their feudal Gulf backers, it is the very fact of their opposition to the anti-western, brutal dictator Gaddafi, and the support of those jihadis from western "democratic-imperialism" that led them to look the other way, a mistake they were well on the way to repeating also in Syria. hold on everyone. The UK is about to be hit by a political asteroid around the end of March. After the impact the world will be very different. There is everything to play for. Boffy: "That is why whether in the case of the SWP on one side, or the AWL on the other we see these "Third Campists" actually abandoning the camp of the working-class in practice and lining up with either various reactionary "anti-capitalist" or "anti-imperialist" trends, or else with "pro-bourgeois democratic imperialist" trends"; Boffy: care to give an example of where the AWL does that? Absolutely. It's even actually referred to in the post above. Its what the AWL did in relation to Libya. Your position in supporting the western and feudal monarchical backed jihadis stood in sharp contradiction to the position they take in relation to Hamas Hezbollah etc. In one comment, on the AWL's then website, by an AWL member, it talked ridiculously about those Gulf Monarchies being the vehicle by which "democracy" was being brought to the Middle East! The AWL contrary to its argument in relation to Hamas etc. argued that it had to be expected that the Libyan rebels might go a bit astray, and "not be perfect", because they had had to endure decades of oppression under Gaddafi etc. It argued vehemently that those jihadists were not really jihadists, that the black flag was not about to be flying over Libyan government buildings, shut its eyes to the rounding up of black government workers, and their subsequent imprisonment, and torture. Actually, Jim, I will go on anyway. The AWL having adopted this position also then tries to rationalise it, and does so often by gross distortions, often of the writings of Trotsky, in relation to practical situations. For example, the AWL have justified their position of not opposing imperialist intervention in the Balkans, by referring to a particular snippet of a quote from Trotsky's War Correspondence from the Balkans Wars. According to the snipped the AWL cite, it says that a Marxist party cannot sit idly by whilst atrocities are being committed. The AWl interpret this quote as meaning that we cannot stand by whilst atrocities are committed , say, by Milosevic, and that if our objective of ending those atrocities can be achieved by liberal intervention by "democratic imperialism" we should not, therefore, oppose it. But, as I've described at length - Lessons of the Balkans that snippet, and the interpretation the AWL put on it is a total distortion of what Trotsky actually says, both in the full quote, and in the rest of his writings on the Balkans, where he OPPOSES liberal interventionism, and says that socialists should mobile against it! In the specific quote from which the AWl take the snippet, he is talking about atrocities committed by the liberal interventionists, and the censorship of reports of those atrocities! But, the AWL have based their arguments for not opposing liberal interventionism, on their distortion of what Trotsky says in relation to the Balkans. So, if you want the roots of that it goes back to the AWL's position in relation to the Balkans, but, ideologically, it goes back further to that, and to their collapse into Third Campism, and the acceptance of the subjectivist, petit-bourgeois, moralistic arguments of Burnham-Schactman in relation to the USSR. That petit-bourgeois moralism leads them to line up with that class camp that more closely aligns with their moral imperative, just as does that approach lead the SWP to line up with "anti-imperialist" and "anti-capitalists". There is a further post from the time in relation to Libya, which shows the way the AWL zig and zag in typically bureaucratic centrist fashion to cover up the contradictions in their theoretical positions as they are exposed by their inevitable testing in reality. George - I couldn’t work out if you were taking the piss or not! Boffy of course says he is against this war or that war but that doesn’t extend to any meaningful opposition to any of these imperialist wars, to say he opposes these wars is literally an insult to those who actually do. He thinks staying pretty much silent on the predatory murderous adventures of ruling classes across the globe is enough, all the while hinting at its glorious benefits. All Boffy sees when the ruling class kill a million or so natives is the prospect for future investment, he doesn’t even see the theft and robbery. Moreover Boffy often then pins the blame on the victim of imperialism, such as his hostile attitude to the Palestinians and their resistance against imperialist brutality. He then casually and lazily lumps all native societies as dictatorships, and in my mind by doing this simply parrots the Western ruling class view of the globe as simply ripe for their civilising. If there is a difference between the worldview of Boffy and that of John Bolton I can hardly find it. And with Denham it goes even further. He literally cheerlead the invasion of Iraq, he even posted on his site a picture of a young Iraqi girl playing the piano as proof that civilisation had finally come to Iraq. These are the kind of people we are dealing with here, the ultimate chauvinists. Not only do the likes of Boffy say next to nothing about the savagery of the ruling class, they actually continually put on a gloss on this savagery. The likes of Denham and Boffy have done nothing but put position into the movement and debase the proletarian character with their odious chauvinism. If you want the Marxist view try reading the Civil Wars in France, then read Boffy and Denham and then weep! Here is further evidence, and history on the matter. In the 1980's, the USSR were being fought by the Islamist Mujaheddin, which was being organised by Osama Bin Laden with help from the Saudis (of which his family was an important element), and by the US military and CIA, which channelled funds and weapons to him, via their proxies in the Pakistani Dictatorship. The AWL's predecessors (Socialist organiser/WSL) supported the ousting of the Soviets, despite the fact that this would inevitably lead to their replacement with the Islamists - which is what happened. In Iraq, of course, they argued that it was not possible to argue for the withdrawal of US troops, as they had done in relation to the USSR in Afghanistan, because to do so would mean to invite the Islamists to take over! In the early 1990's, the Kosovan Liberation Army, were a rag tag bang of vicious gangsters, infamous for kidnapping people removing their organs, and then selling them. The US, via their links at the time with Bin Laden, sent him as emissary to speak to the KLA, and offer to supply them with funds and weapons. They agreed, and began their campaign of ethnic terror in Kosovo, kidnapping Kosovan Serbs, murdering and paign, and setting fire to villages, so as to whip up an ethnic conflict where none had existed. There was a good documentary shown on TV at the time documenting this. Having whipped up this hate war, Milosevic sent in his troops in defence of the Kosovan Serbs, which provided NATO with its pretext to launch its invasion. We know from the British General on the ground at the time, Mike Jackson, that he had to defy a direct NATO command from the US commander to press on to Pristina Airport, to confront the Russians, because to have done so, would in his words, have started WWIII. During all the time that the KLA murderous thugs were undertaking their CIA sponsored reign of terror in Kosovo, the AWL said nothing. Only when Milosevic responded did the AWL justify NATO involvement in the conflict. Nor has the AWL said anything about the ethnic cleansing and oppression of Kosovan Serbs since that war, both by the Kosovan Albanians, and by NATO forces on the ground. That is just the kind of partiality on the part of liberal interventionists that Trotsky was talking about in his pieces in relation to the Balkan Wars. I remember debating Boffy about the British role in India, he was all railways and enlightenment and basically presented the Niall Ferguson view of the British Empire, he combines a right wing historical perspective, a right wing geo political perspective with a chauvinistic and anti proletarian morality. Even when I showed him the research of Indian Marxists, such as Prabnat Patnaik, who had even gone down to the calorie intake of the Indian people to show how the British systematically underdeveloped and over exploited India. But when faced with these facts he simply rubbished them without foundation or ignored them and blathered on about railways again. Incidentally Boffy has a word for people who actually oppose imperialism with blood, sweat and tears, he calls them idiot anti Imperialists! Isn’t Venezuela a classic example of this fake anti imperialism? Instead of standing in solidarity with the Maduro government, a government which has brought real gains to the producer classes in Venezuela, people like Boffy give us vague slogans about taking no sides but the side of the people. Which people are those? The people who want to undo all the important gains made by the producer classes and look in horror as the great unwashed are allowed some say in the affairs of the nation? I.e. the arrogant and chauvinistic middle classes? To say lets stand with the people is just another way of saying let the US vultures have their way without any fuss. It would be like staying neutral during the Vietnam war. Neither the US or the Viet Cong, we are with the people!